Cappen Varra is a minstrel of the south attempting to make a fortune by going to the north and offering services to the kings in the north. Unfortunately, the plan doesn't quite work out. One king is fond of him but has not offered him any real profit. While at sea, they are hit by a terrible storm. In dire need of fire, they see a red light from an island. They send Cappen off to the island to retrieve it but the local islands are covered with trolls. Cappen is no brave soldier so he's absolutely terrified. His only hope is that he has a charm from a wizard that will protect him against harmful magic and that supposedly, trolls cannot do harm to someone who does not fear them. He finds the source of the red light--a cave fire for a troll-wife (which is just another term for a female troll). The troll also has a female captive whom Cappen takes a liking to. The troll-wife believes she will feast on Cappen but he challenges her and ultimately, loses through Cappen's superior wits. He takes the woman, whom he realizes is the daughter of the king he currently is employed by and returns to the ship. It's at this point that the woman explains that his magic charm couldn't work because the troll was not magical. Also upon returning the daughter to the king, the king promises Cappen the kingdom and his daughter's hand in marriage. Early the next morning, Cappen runs away. A fun and light-hearted story compared to some of the others I've read this past month. 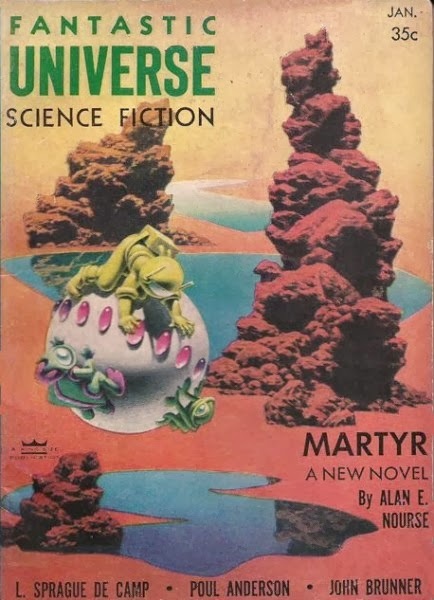 It is amusing to see a story like this--that is, fantasy--published in a science-fiction magazine but given both were just emerging genres and there is overlap (Anderson is more well known for his science fiction), it's to be expected.